It’s cold and snowy and we want to see some green! Sometimes the only way to survive our brutal winters is to laugh with fellow gardeners. Talk a peak, we’ve compiled our top ten signs that you may be suffering from gardener’s spring fever. 10. You have not only watched but recorded every garden show on PBS and HGTV. 9. You rush to check your growing table every day to see if your seeds have sprouted. 8. Stacks of garden magazines and catalogs are obstacles that you must navigate safely to move through your home. 7. You have reached the maximum pins allowed for garden ideas on Pinterest. 6. You brought a bag of potting mix inside just to get a hint of that fresh spring soil smell. 5. You don’t hesitate to brave the treacherous winter roads to enjoy a day of beauty at the Garfield Park or Oak Park Conservatory. 3. You have taken so many classes at the The Growing Place you are on a first name basis with every instructor! 2. 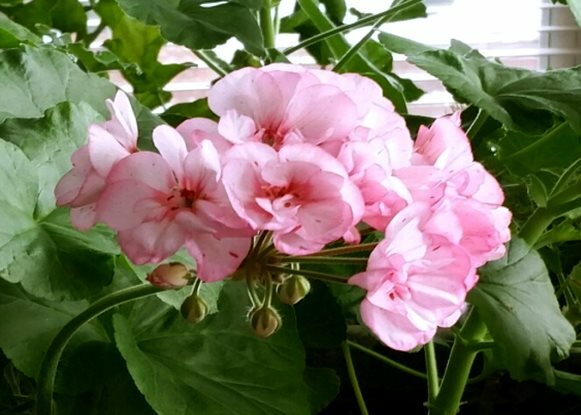 Valentine’s Day was no big deal compared to the love you show your overwintered geranium when it starts to bloom! Just think, there are only 29 days until spring and 37 days until Opening Day–we can make it! See you soon!